Test your genetics right at home! We all want to be realllllly healthy and it makes sense that what we eat is a place to start. Right? Well not so fast. Jenny (isn’t her real name to protect the innocent) went to her health club to lose some weight and get into shape. Jenny had always struggled with being overweight and was even laughed at in grade school because she was plump. (not funny if you’re one of those kids) Some things, good or bad, never leave you and Jenny’s struggle with her pudge was coming back to haunt her. She tried everything: exercise, those wonderful diets, positive thinking, reading books, and crying herself to sleep–nothing was working and she was becoming desperate! “Maybe my problem is because of a food allergy!” she exclaimed to herself during a brief period of self-acutalization. Rushing to the nearest health club, she indeed found someone to test her for foods. One month later when she came into my office for advice, nothing had changed. Exercise was tough, her diet was hard to manage, and she was still FAT! The problem with foods is a tough issue. Don’t kid yourself, a piece of chocolate cake is hard to resist even if it is on your birthday! You have to be reasonable with willpower and sometimes it’s just not practical to eat like a rabbit. Maybe if I have a food allergy, the reason to avoid “bad foods” is more compelling. We have convinced ourselves that a problem with food (s) can be hidden. For instance, maybe a food is bothering me and I just don’t know it. While this may be true for a limited amount of time at the onset of any illness, usually insults to our body signal RED ALERT very quickly. Remember your last viral infection that was harming your body? Fever, chills, feeling terrible was your body’s way of alerting you to a foreign invader. The same can be said for foods….your body is pretty smart and will usually alert you to a “hidden food”. This brings me to my next point. With all of the tests available for food allergy/intolerance, which one is the best? Is skin testing best, or should you obtain a test such as the one illustrated fromHaloHealth to determine your genetic make-up? Positive skin tests look like this…. The correct answer is e: none of the above! 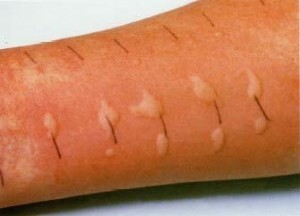 The most accurate and least expensive test for food allergy is the elimination-challenge procedure. It’s a pain to do, but this test will help you to determine if a food is causing your problem…guaranteed! 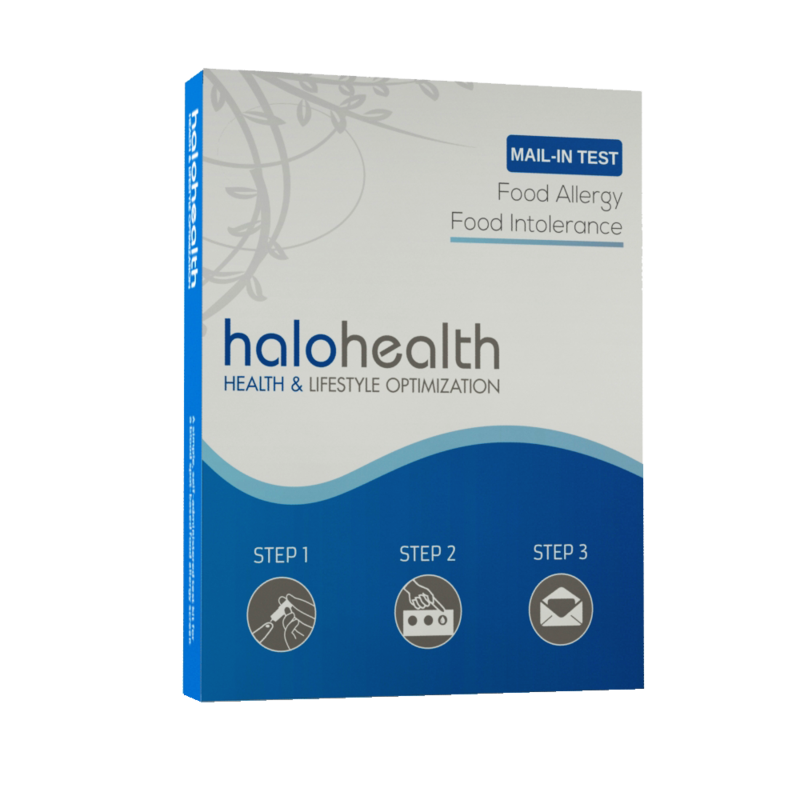 The problem with ANY test for food intolerance is that a positive test doesn’t mean you are going to have problems when you ingest the food. Many foods will test positive on skin testing, blood testing, and any other test you can think of but patients can still eat the food with impunity. This is a “false positive” food test and occurs in almost 50% of positive test results. Take your list of foods and cross out those that you already know you don’t have a problem with. For instance, if your testing says you’re positive to milk, but you drink milk all the time, you don’t have an allergy. This test was a “false positive”. Once you’ve eliminated the obvious, start with a food elimination. Take only ONE food out of your diet at a time and see if your symptoms (have to know which symptoms you’re monitoring) improve. Let’s say for instance, you suspect that wheat causes more headaches. You eliminate wheat for 1 week and you still get daily headaches…..guess what? it’s probably not the wheat. Let’s use our wheat example for the last step: food challenge. In the example above, if wheat elimination gets rid of your headaches, you might have a wheat allergy/intolerance. How do you prove this for sure? Add wheat back in and if the headaches return, wheat should be permanently eliminated from your diet. Sound like a lot of work? It is, but following the above instructions will allow you to liberalize your diet with the peace of mind that you’re not making things worse by eating the food in question. Keep in mind, this elimination/challenge diet does NOT apply to a true food allergy–food allergy with anaphylaxis requires immediate attention and possibly use of epinephrine. If you’re confused about which type of adverse reaction to food you have, please call your doctor to discuss your next plan of action. In the meantime, bon voyage at the dinner table!